Q: Isn't the aim of Buddhism to reach Nirvana? A: Well, Yes and No. Buddhism is not an effort to arrive at an unknown happiness but to get rid of a known unhappiness. If Nibbāna is understood as an absence rather than a presence, you are right. This is a rock bottom solid fundamental of my understanding of the Dhamma that has held up now under study, examination, test and retest for 30 plus years! It makes the entire Pali system understandable. There is no way the value of that could possibly be calculated. It absolutely revolutionized my thinking, period. As a book, this work is deeply flawed. This is, I believe, at least partly a consequence of the anxiousness of Bhante Punnaji's students to see his work in print before it was properly arranged for this medium. The work consists of a scrapbook of lecture notes and retreat guide-sheets, and consequently is annoyingly repititous towards the beginning (the latter half is much better reading). In addition the terminology is, while not being contradictory in meaning, inconsistent from presentation to presentation. The worst aspect of the work is the use of the Pali. Bhante Punnaji's interpretation of the Pali is radically different than the common usage out there, but his translations are presented with no justification (well ... towards the end there is some discussion of the occasional word). I think this is very unfair to all concerned. It is not reasonable to expect that those familiar with the standard translations should simply accept the statement: Upekkha means Introspection; Ariya means Super Normal; Upadana means Personalization; Avijja means Unconsciousness (as the most bothersome of examples). Another aspect of the presentation I could live without is the occasional digression into modern Psychology. Modern Psychology is a discredited system which no intelligent individual looks to today for any kind of guidance. In the seventies when Bhante picked up on it, it was already a money making scam that had become a fad. The "Psycho-Therapist" knew that if he kept his mouth shut, kept the dirty secrets of his personal life out of the picture, and assumed the aura of the dignified person projected on him by the fool he had convinced needed "Therapy" for a disease he did not have nor could the therapist cure, the patient would attempt to emulate this "best image" and alter his behavior toward the better and voila! feel better...your 50 minutes is up, $90 please. Freud and Buddha are 100% opposites: Freud's theory rests on the premise that the mind is essentially evil and must be restrained by society; Buddha holds that the mind is essentially pure and needs to be cleansed of the corruptions that come from without. One of those corruptions that needs to be scoured off is modern Psychology! Had the duplications in the description of the method presented been eliminated, and had the system been presented without any reference to the Pali (or had the Pali terminology been given thorough discussion) or to Modern Psychology, I believe the work would have proved extraordinarily powerful. 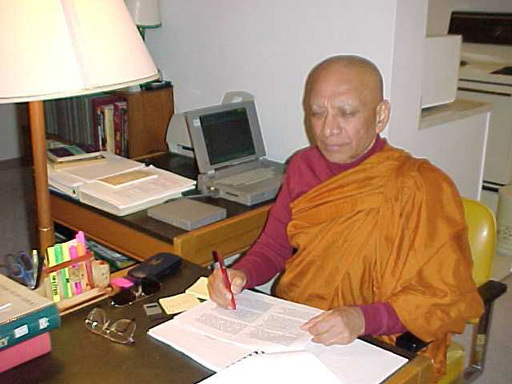 As it is, with the innerds (so to speak) laid bare; what we do have is an opportunity to look into what is really going on in the mind of Bhante Punnaji. This is a no questions about it interesting and challenging read, but to be undertaken by those willing to spend the time asking at every sentence: "Does this accord with the suttas, does this accord with my experience?" "Sometimes meditators are not sure whether the awareness of body, sensations, moods and thoughts are to be practiced separately or all together. My understanding is that the Satipatthana is the practice of awareness of the reaction of the body to sensory stimulation. This reaction is observed first as a physical movement or a tension in the body. Then as awareness deepens, it is observed as a sensation. Then it is observed as an emotion and lastly as a thought." In other words it is a progressively deeper and deeper view. This is absolutely unique and makes great sense and heightens it's potency tremendously. It is vital for anyone interested in this sutta that this book be read for this view, if only to ask, as withall: "Does this accord with the suttas and my experience?" And, O Yes! There is an Index! The Buddha is said to have been able to make himself heard throughout the thrice-a-hundred-thousand-fold universe. The way I see it, with the advent of the written word and printing presses (not to mention the computer and the Internet), the ordinary man is now capable of making himself heard at least around the world. This power having been given to us, I do not think it is out of line to respond to a communication of such nature as a book as though to the word, spoken face-to-face. Additionally, in the case of Awakening Meditation, we have your overt request for feedback. An idea of the French writer, Marcel Proust comes to mind: that in this world of polite conversation, the written word is perhaps the only really honest communication we have left. So I hope Bhante, that you and your loyal followers will accept this as intended: "This is my reply to your words: I have listened. I have meditated upon your words. I have tested the ideas new to me to a small degree. I have compared what you have said to my knowledge of the suttas, to my understanding of Pali, to the Pali English Dictionary, and to my personal experience. I have some thoughts on what you have said. This is my response to what I have understood of what you have said. I would welcome any further clarification you might wish to contribute. I wish you only the best in this world and in whatever your destiny may be." "This is the original method of the Buddha found in the Pali Nikaya teachings." This book tells "...the real story of original Buddhist meditation as taught by the Buddha." I feel this idea goes way too far and was probably made without calm reflection. Just on the face of it (remember, we are dealing here with the written word, and the written word must be taken literally, unless there is clear indication that it should be taken otherwise), the Buddha's teaching is in Pali, and the Pali alone can today make the claim to being the original method of the Buddha. Next to that would come an accurate translation, not an explanation. Next to that would come an explanation of an accurate translation that adhered to the structure of the suttas (such as I have attempted to do with The Pali Line). Your method (that is, the structure of the system you use to bring an uninstructed common person to the condition of Arahant) is not found anywhere in the Suttas precisely as you have laid it out. Now if what you really intended by these statements is the fact that you have uncovered a few key concepts which shed light on the meaning of the suttas in sucha deep way as to be clearly in accordance with the intent of the original teachings, then this I find totally acceptable. The idea that Nibbāna is the getting rid of a known unhappiness (dukkha) and not the acquisition of an unknown happiness, and the corollary, that the method is therefore one of Not-doing and Letting Go. The unstated fact, evidenced by the manner in which you piece together a method from various dhammas to suit the needs of your students, that the Dhamma is a collection of complimentary "units" (I have used the image of Tinker Toys, or an Erector Set) each of which is essentially complete, but capable of being pieced together to facilitate greater understanding at various levels by various "ears" and so suitable for manipulation according to circumstances. The idea in back of "experiencing experience" as a paradigm shift from the ordinary "experiencing existence". This is a most excellent, revolutionary, and exciting idea which needs qualification or refinement to my mind. The fundamental idea in back of this concept is liberating, but there are two problems: 1. the term "experience" is fundamentally bound up in the idea of an experiencer. There is no way that this word can be separated from that. And 2, it is rarely, if ever, that Nibbāna is defined in the positive by the Buddha. It is always in terms of "It is not This." The conceptualization of Nibbāna here is a positive statement that serves well only as an illustration or simile. In the Lesser Emptiness Spell we have: "This way is empty of the disturbance emanating from the grip of sense pleasures. This way is empty of the disturbance emanating from the grip of living. This way is empty of the disturbance emanating from the grip of blindness. This way there is only this that disturbs the emptiness, that is the six sense-realms bound to this body reacting to life." and this is the meaning I understand for this idea; but we also have, at the end of the BrahmaGala Sutta: "For so long as this body shall live, gods and man shall see me; but at the break-up of the elements at the death of the body, neither Gods nor Man shall see me." And while this latter "state or condition" may be said to be "without existence" it cannot be said to be being "experienced." The manner in which you have conceptualized the Satipatthana sutta as a progression marked by ever more refined perception of the experience of individuality is again a really deep clear vision and is extraordinarily helpful in understanding the method of the catari satipatthanas. If this is what you have really intended by your claim, I am largely in agreement. Otherwise (and in any case concerning the actual words of your claim), this is the essence of what I think you (as many others, including myself when I am not being careful!) is missing about the Buddha's Dhamma: it is the Elephant, and we are the blind men. By that I mean that each word, and the system as a whole is so constructed as to have helpful meaning to the beginner, to one who has made some progress, and to the one who has attained as well. Dukkha really means dukkha. This is a thesis of my own: that the Buddha chose Pali as the language to transmit the dhamma because it really is either the root language, or is very close to what was the root language. This has the effect, of allowing for no translation. (You can 'ear that either way). This means it is possible that a complete stranger to Buddhism and Pali, coming across the Pali (and having heard the words) could arrive at the meaning for himself across all cultures, states of consciousness, and Time. Thus the First Truth, for example, can be understood this way: "Know k-kha" The hunter knows his k-kha. The hunter examines the feces of his prey and discovers what that prey eats, how often he eats and how much he eats. Understanding what that prey eats, he understands what it craves, desires, hunts for. Understanding this he can anticipate where that prey can be found in the future (at the source of it's food). So the man wishing to understand the Buddha's method, understanding himself to be seeking the answer to the problem of death, or the fact that he is being hunted by death, needs to understand what it is that the hunter can know about him from his cravings, and if he wishes to avoid capture, he must cut down on those cravings so as to lessen the chances that his eating habits will be anticipated by the hunter...and so on. In other words, the Buddha has so constructed his system as to be comprehensible at an absolutely fundamental, rock bottom level. Those who are more sophisticated may understand in their own terms from the root concept, the reverse is not true; so the way the teaching is made universal is not to use more and more sophisticated terminology, but to use the root terminology. I know it is possible that if I thought of this, someone who is omniscient (someone with aaahn-nyaaa) did also. Up-past (or down-past) "grunt-Pali", Dukkha is defined in the MahaSatipatthana and elsewhere as meaning Physical Pain. So Dukkha means Pain. Since, in English, the word Pain is used equally to indicate Physical Pain and Mental Pain depending on context, and this is clearly the same in the Pali, there is no need, and considerable disadvantage to translating the word as anything else. Then, with the word so defined, the beginner hears "Physical Pain! ", the psychologist hears "Angst", another hears "Discomfort", another "Suffering", the one with some progress hears "All kinds of Pain!" or a little deeper he may understand: "What is intended as pain is being continuously subject to rebirth." and so on. But what the presenter of the Pali needs to remember is that what we have here is the Elephant. Dukkha means Dukkha. And that "Well Taught by Gotama was the Dhamma." and that when we resort to analysis and explanation we should remember that we are trying to communicate the Dhamma to a specific group, and that in that case it might be acceptable to use a specialized meaning, but what we are really doing in such a case is narrowing the meaning, not discovering the meaning and we should be careful to avoid the idea that "This is the REAL meaning of...", meaning that the way we see it is the only true way and all other ways are wrong. The Pali as we have it is emmence...thousands of suttas in number. The result, whether planned or not, is that the presentation (description/explanation by Gotama) of the system is highly redundant (and if we follow the Buddha's instruction to compare sutta with sutta, self-correcting). In most cases, a sutta was a beginning for some questioner; in most cases it was also the only sutta they would ever hear. The result is that the system is presented "complete" thousands of different ways. At our vantage point in time (most especially now that we have the Internet), we have the possibility and also the obligation, when we venture to "translate" the suttas, to make sure that our translations are consistent across each and every one of those "complete" presentations of the Dhamma. That way we will subject our translation to the process of self-correction built into the system itself. . . or. . . if we feel the need to use specialized language (meaning our translation is deliberately, consciously not necessarily helpful to the beginner, or one in the middle or one at the end, but only to a certain group at a certain level of consciousness, at a certain point in Time), we should be careful not to claim to be presenting the Dhamma as it was originally intended to be presented...Dukkha means Dukkha. I have investigated most of the translations of the Pali included in your book and for the most part can see that although they are often unusual, they are defendable in both spirit and letter. Several words I cannot reconcile: upadana for personalization, avijja for unconsciousness, and upekkha for introspection. One idea, identity/entity for nama/rupa is the best translation yet in my opinion. Upadana: I can see this as "taking up" which can be worked into taking on as personal, if this is how this idea is arrived at, but the implication is that personalization occurs after hungar/thirst (tanha) and hungar/thirst is not raw experience, but experience that has already been personalized. With avijja as Unconsciousness, this whole construction looks like it has been dictated to avoid the problem of discussing previous life in a society that does not accept the idea of previous life. "Downbound avijja rebounds bound up in Sankara". Vijja is defined for us as not understanding the final outcome of acting to create, in Pain (Dukkha). One invests (personalizes, sankarams) in future existence through intentional, conscious, acts of mind, speech and body. I think this, more conventional presentation, is not inconsistent with your "experiencing experience" outcome. Upekkha is the fourth "abiding with Brahma"
In my view, Upekkha is the end result, even when not explicitly stated, of every single dhamma, long or short. I don't think introspection, even your calm detached introspection, holds up under this burden. Calm, detached introspection is a tool to be used to identify that which should be let go of, the result of that is Upekkha, just the detachment. This may be a fatal flaw in your system in that your Nibbāna is conditioned by this calm detached observation, and Nibbāna is not conditioned. One idea I find is internally contradictory. On the one hand you condemn concentration, but on the other hand your method can be seen to be using a process of focus by elimination of distraction which is otherwise understood to be concentration. I think the defensiveness concerning the idea of "concentration" is understandable as a reaction (ahum) to the emphasis it is given in other systems. My feeling is it is a better tactic to just simply present your own system and not do battle with all the useless ones out there. These are my thoughts after several days of intense . . . um. . . concentration on your book. I have thoroughly enjoyed the mental challenge and consider you, as always, one of the great teachers out there. I hope these comments will be taken with the light heart and lively mind I have come to associate with you. Ariya Atthanghika Magga as Supernormal Eight-fold Process. Bhante Punnaji [BP] sometimes says "usually translated..." and sometimes says "usually mistranslated..." "The Noble Eightfold Path", etc., the latter statement I think is unjustified. Ariya is from the base for the name the dominant population of the place/time called themselves, so it is not all that unfamiliar to hear "Super Race", although the connotations, given recent history, are horrid. I hear the word as A=to RI=the sun YA whatsoever. So "super" is not out of line, however, I still hear our "Aristo crat" and think it a better all round fit. Usual translation: Noble. Anghika is from the word for a limb (of animal or tree) or the thumb or arm or leg at the bend, or elbow, so we get, "angle", so fold is acceptable, thinking of a piece of paper that is folded up, but my preference is for "dimension" or "angle" as the way I read it, (although the way may be seen as a process), is that each "fold" is also a path which may be used on it's own to view the whole. Magga as Process is where I think BP's translation breaks down. This is a word which must also be made to serve in similes and in those similes the meaning is "road" or "Highway"; and we do not drive down the process. Samma as Harmonious: Samma is usually translated "right" originally from the idea of a perpendicular (right angle) a carpenter's term. I agree with BP that "Right" is not a good translation in that it is here today (Saturday, July 28, 2001) not even remotely associated with the original idea of Upright, but is focused intently on the idea of being the only correct (righteous) thing. The concept is clearly not intended to have been one possessing the only truth in that even "samma" this and that are to be let go of by the Arahant. It is also possible to relate this word to sama (even, level), and from there to sama, (tranquillity) and from there to harmonious. I happen to agree that the greatest likelihood is that the different spellings of words that sound the same (putting aside the long vowel) came after a point of common origin (if this is the justification). Since this is not the usual way this word would have been derived, I think it needs to have been explained. I prefer my "high", hearing "summit" "sum" "suma" or "consummate" which has the advantage of being more conventionally acceptable etymologically if not in Buddhist circles fearful of the association with drugs, and of being better related to it's opposite: miccha, contrary, or (hearing mi=small, ccha = k=kha) "low." And High, or best, or consummate does not carry the implication of being the only right thing. Sankappa as Disposition or Orientation. No real problem, it's a matter of Perspective. I see the details (letting go, non-cruelty, and non-harm) as the principles one would adopt having High View; Bhante sees them as the direction one heads. The word means: "One's own Fit-n-Propper" >Kappa, fitting, as in the harness of a team of oxen, or as in the fittings used on boats, >to it "fits". Vaca as Speech. OK. But vi Talk in English, they sprach in another Pali dialect. and arrive at "works" as one word that works for all. Ajiva as Lifestyle. OK by me, as I use the same. But Bhante's explanation of what it is that this is is not in accordance with it's explanation any place I have seen it explained: pg 6-2: "harmonious life style is the unselfish, socially oriented, honest, compassionate, and tolerant way of living that is helpful but not harmful to anyone in the world." In the Satipatthana and elsewhere this term is defined in the negative: "When one rids one's self of that which is understood by one's self as a low element of one's lifestyle, what remains is high lifestyle" I find this more consistent and satisfying in its relationship to the goal of not attaining an unknown happiness, but of getting rid of a known unhappiness. I see this as the process. Sati as Attention, and satipatthana as sati uppatthana as the Introversion of Attention. The way sati which is mind or memory is usually turned into Mindfulness is through the patthana, the "setting up" or "manufacture", so the manufacture of sati -- memory/consciousness/mind -- becomes "mindfulness." I see patthana as from Pasture, (pa=past; thana=/hunger thirst, or wishing or wanting) and also going to manufacture >factor, get satisfaction (having reached the state where one has had enough as a result of having found what one was looking for). Samma sati and satipatthana as the setting up of Attention goes against BP's concept of Nibbāna as a "without" thing, hence his need (and my own) to recast it, but I think that beating upa into within and making patthana into uppatthana is not a very subtle way to go about it. BP also uses sati alone for looking within (p3-14) which I question. Samadhi as Mental Repose. This is one that BP has been using since I first knew him. Again, this must come from sama: even, tranquilly. While I agree that Samadhi has this quality, I don't see the word this way. PED has it coming from san (that's ng) and adhi; one's own overmore (which is justification enough for "High," but I prefer to see it as a magic charm: SA=one; MA=make; DHI=this; DHI=this; MA=make; SA=one; One Chew Dis; Dis You One. (Once you do this one; this one makes you one) reading it forwards and backwards as is the way with mantas. Now how else, I ask you, are you going to derive a word describing getting high from a drug culture? (The arians were drug users from before even they came down the Hymalias, and were SOMA drinkers even just to about the time of, if not during the time of the Buddha. I think what the Buddha did here was to take a term for an existing practice, "getting high" (understood in exactly the way that it is used by drug users today), that was used to attain magic powers and the arupajhanas, and insert into it the four jhanas and convert the meaning to serve his goals. Hence I believe I am following in the footsteps of the Buddha when I translate Samma Samadhi as High Getting High...Buddhism is a better way, a Higher Way of Getting High. A way of getting high without drugs, without being drugged -- "drugged" being a simile for avijja, or the blindness of the ordinary common man. Ekaggata as stillness of mind, calmness, tranquillity, mental stability, mental repose or a state of equilibrium. Essentially defining this term this way serves to eradicate "concentration" from the system. Usually translated One-Pointedness; there is in PED, for tranquillity, the word EKA-AGGA One-Top (I think, to get to tranquillity, we would hear it as One-Down, Whew! Made It. That's done, finished, which is the "explained meaning", that is, the tranquillity of one who has attained the way...I feel stretched!). I hear EKA=one; AGGA=top (tip, point); gata=got I do not see how you can get to stillness in this word without becoming one-pointed first. I do not make of concentration the end-all (hum...end-one? ); but the tendency of those who detract from concentration is to throw it in with a mad kind of effort to attain magic powers. I see concentration as a tranquil thing. I learned of it from a few people I knew (Ven Mew Fung Chen, for one) who were able to stick to a a subject of discussion or to an activity in which they were engaged in spite of huge ruckuses going on right next to them (Venerable Mew Fung sometimes had a hundred people in the same room with him talking and carrying on and would be speaking to me about some topic as though we were alone!). Totally tranquil, completely undisturbed, but focused to an enormous degree on some one thing. Vitakka as inference and Vicara as inquiry. BP puts them in the reverse order of their usual occurrence which is the way they make sense according to his understanding. My understanding is that both these words used to be synonyms and also that they both used to stand for what we understand in simple terms as thinking. VI=2 TAKA=Talk (re-think in words) and Vi=2 CARA=wander around (search) (re-search -- when I want to draw useful distinctions, I cast Vicara as re-thinking in pictures just to point out the idea that this is an aspect of thinking that should be Let Go Of). I think trying to impose a deeper meaning on the terms has caused this displacement in order and is unnecessarily complex (and has the effect of inhibiting attainment of the jhanas). Here I think Castenada's discussions of The Inner Dialog, and how to get past it, are extremely helpful. Piti as Rapture. This word needs to serve in the progression through the jhanas as one of the things that is left after vitakka and vicara have been got rid of (it is also there before they are got rid of) (it is let go of prior to entry into the 3rd Jhana) and it is one of the "Factors of Wisdom" on the side of Energy Building and Investigation of Dhamma, and is the factor prior to Passadhi (BPs Relaxation, my Impassivity or Poise). I usually use Enthusiasm, but I have never been too enthusiastic about the word, but I don't like rapture either. In this country it has overtones of being an old European state of religious extacy, or a goal in itself. Sukha as Comfort. Like Dukkha, this is not incorrect, just not sufficiently encompassing. This word must be also made to serve for the taste of sugar to the ordinary person. Sweet or Pleasant. Panna as Penetrative Awareness. This is unusual but fits all round as far as I can see. Nibbāna as Imperturbability, Experiencing Experience. Imperturbability is an attribute of Nibbāna. BP uses it as a translation for Nibbāna (p1-12). He derives the word from the Sanskrit where he gives the meaning: Nir=dis; vana=shake. First of all I believe Pali is older than Sanskrit, and secondly I believe the sounds in Nibbāna are older than the sounds in NirVana. Ni=down; ban=bindup; na=know. But the usual translation of Nirvana in Sanskrit is Extinguish, or at a more basic level, Out of the Woods. He similarly uses Experiencing Experience in this way. The Buddha rarely, if ever defines Nibbāna other than as what it is not. Since this is also fundamental to BPs system, I have a hard time understanding his inconsistency in this case. The worst aspect of this is that the word experience is impossible to divorce from the idea of an experiencer as much as BP is attempting to do this I believe it fails in a way that is damaging to his case. It is hard to balance this criticism of the use of this term with the fact that the way it is used in BP's system is unique and extraordinarily helpful in positioning one's practice. I think had the same terms and expressions been used with careful cautions in every case, it would have been more valuable. Paticca samuppada as Antecedental Concurrence. This may be how it works in one of the ways it works, but there isn't anything of "Antecedental" in the word Paticca. "Pati" always carries with it the idea of "bounce" "rebound". Out on a limb here, I don't think anyone has this thing better than I have it (see ../../dhammatalk/the_pali_line/course/the10thquestion_2.htm#DOWNBOUND_CONFOUNDED_ETC). . . I will stick to my compound of paticca samuppada and Nidana paccay'acara as Downbound Confounded Rebounding Conjuration. Nama/Rupa as Identity/Entity. That has to be the best translation yet. Unfortunately BP uses Identification of Objects and Identification and Appearance (meaning that nama is the construction process and Rupa is the thing constructed). This is apparently based on the perceptible phenomena that from the point of view of the individual, there is no distinction between creation and consciousness. I have discussed this issue in my discussions of Pajapati's Problem. "Monks, there are these four kinds of grasping (upadana)...the grasping of sense pleasures, the grasping of view, the grasping of rule and custom, the grasping of the theory of self"
This followed the discussion on two views of becoming (bhava, the view of the eternalists, and vibhava, the view of the annihilationists), the point of which was to say that not understanding the rise and fall, attraction and peril of these views was to be not enlightened. Upadana then follows as that which gives rise to the views of bhava. BP has "possessiveness and personalization of objects perceived as well as the subjective experience . . . capable of being analyzed in terms of the . . . pancupadanakkhanda)". Somehow this term must be made to serve as the bridge between the experience of wanting something and the fact of having it (or not, depending on one's kamma, but in any case being in the place one imagined one wanted to be in order to get what one thought one wanted). This is not the static state of "making personal". One goes after getting sense pleasures, one does not just make them personal in order to experience living (I guess BP is saying that that is exactly the case, but that is not what I mean. I am saying that there must, at some point be action to create. And I am saying that the personalization that made experience into existence occurred at sankara). One goes after the idea of existing or not existing in order to explain the living one is about to enter. One certainly does not employ rule and ritual (or assumed behavior imposed from outside) in the strictly internal process of personalization. And theory of self comes after personalization not before. I think this must be taken at the face value of the word: Upa=up dana=bound. Getting involved. Getting bound up. Going after getting. Setting the wheels in motion. Grabbing. Sankhara as construction. This is standard enough, but what BP has it constructing and how are, to my mind, an excessive bow to modern psychology. He has it as the strictly mental process of construction of entities in the here and now, after sensation (vedana) and perception (sanna) produced by his sensory stimulation (phassa), and has it as the antecedent of consciousness. In the suttas we are told that the three ways in which sankhara constructs are via acts of mind, speech, and body; personalization here takes place at the time of those acts of construction in that they are done with the intent of producing pleasant, unpleasant, or neither pleasant nor unpleasant sensation in either the self or in another in one's "own" world. We are also told that sanna, vedana, and vinnana are one continuous process which is not subject to being broken apart so as to distinguish where one aspect ends and the next begins. BP's construction of sankhara is necessary to force the preexistence of experience over personalized existence, but this is only necessary if the paticca samupada is limited to a "this-here-and-now-life-only" framework. At this time this book is out of print and a new, completely revised edition is being written, so the links to the promotional materials that existed in this spot have been removed. See for example: Maha Satipatthana Sutta The Truth of Dukkha. You grip the extended index finger of your one hand with the full fist of the other hand. Then you yank (atsa sorta pull inni USA) the finger of your one hand from the fist of the other hand. That's Upekkha. This is my own terminology. For the discussion of it's use this way see: The 10th Quesion, Samma Vijja, Note on Terminology, where I have substituted vijja and upekkha for nana and vimutti. See: Right Livelihood (down a couple of lines). This is how I was taught the meaning of SATI: I was made to sit in a very small totally dark room for hours at a time for most of the day and night, for days and weeks and months concentrating on the meaning of the Satipatthana Sutta, the word Pali, and the word APPAMADA. The word "Pali" teaches one the meaning of language: "Pass Lip" "pass the line"; the word "APPAMADA" teaches one the construcion of words. Listening to the word "Sati" reveals the original intent of the creators of that word...hint: they didn't just pick sounds out of thin air. The similarity of Bhante Punnaji's way of seeing the paticca samuppada to the way it is seen by Bhante Nanavira in his Clearing the Path is very interesting. PTS: Middle Length Sayings, Lion's Roar the Lesser, Horner, trans, pp88).